Last thing you want is a fire you can't put out - I hope I never have to use my extinguisher. "You see in this world there's two kinds of people my friend, those with loaded guns, and those who dig...you dig!" Just checked mine, looks like its had it, will be replacing it thats for sure, its really wobbly around the connection there. found the culprit - a single thick wire, red with black tracer. to the positive battery terminal had parted ways. .
Have you got a photo of this wire as I can't find it. All red or a thick black. Agrees with the 1995 Wiring Diagram and 1994 is the same. You are quite right - on closer inspection it is a solid red wire. The reason I thought it had a black chaser is because the insulation is charred! I have obviously had a very lucky escape. 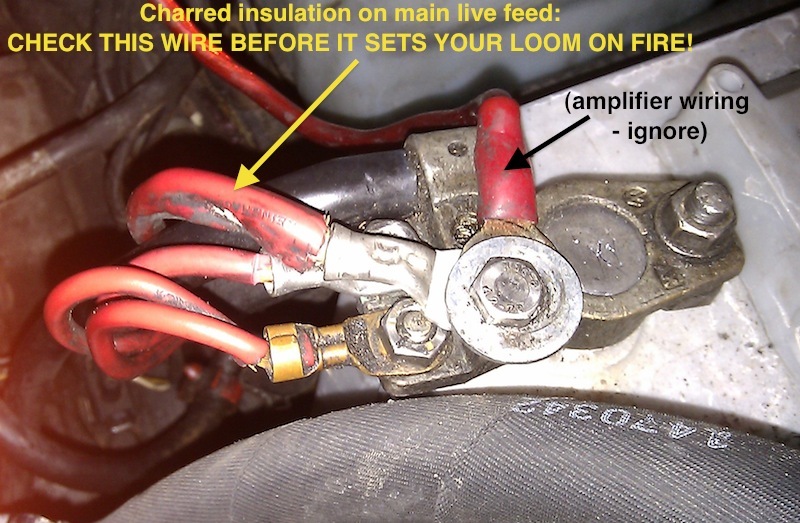 PLEASE PLEASE PLEASE CHECK THIS WIRE BEFORE YOUR LOOM CATCHES FIRE! The wire end is not OEM. Its been remade and badly at that!! See the brass ring tag to the front and slightly below the one you are pointing out. Thats OEM and it should look like that. And the one underneath the faulty one behind the OEM looks a badly repaired crimp as well. Top - Looking towards the windscreen washer bottle. Bottom - Looking towards the left radiator fan. Ignore the two blue ring tag connections along with the double red partly sheaved in black. They are not standard Corrado. The OEM are all brass coloured crimped ring tags. 2 single red wires and a double red wire. Somebody has bodged a double repair on those two cables in your photgraph and both need remaking properly. And the OEM lowest (double red) in the photo next to the black fabric pipe has broken its insulaltion as well. Thats just waiting to happen! Last edited by RW1; 22nd March 2012 at 9:58 PM. The silver crimps aren't going anywhere, they're both crimped correctly with the appropriate tool. I might revisit them at some point if I find some of the original style terminals (to give a little more strain relief) but the second crimped point was where the original wire failed! These tales are always helpful to everyone and help build our knowledge of what sh!t can happen to us unwitting souls. Remember, though, guys, you do not need to use your current-drawing fog lamps unless the visibility is less than 100 metres in fog/smoke or blowing snow. IIRC. In Scotland, the police will delight in booking you if you do. <100 metres visibility is actually relatively rare. 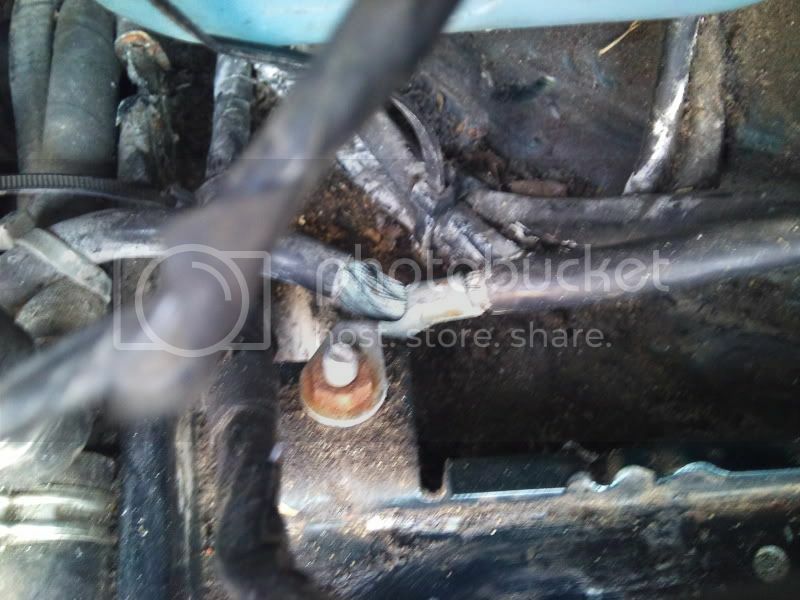 easy cheap fix,fit a rover 75 battery cable,available in every breakers in the land. Last edited by seanl82; 28th November 2012 at 6:24 PM. since reading this thread I have checked the wiring and also the battery. Replaced the battery with new Bosch Heavy Duty item, which in itself seems to have transformed the car electricaly speaking. I also now have a small powder fire extinguisher in the cabin and a larger one in the boot! !..